Chicago’s North Shore area is characterized by charming, historic streets lined with gorgeous homes. Bordering Lake Michigan, you can find the neighborhoods of Evanston, Wilmette, Kenilworth, Winnetka, Glencoe, Highland Park, Lake Forest, and Lake Bluff. Just inland, you’ll find Glenview, Northbrook, Deerfield, Vernon Hills, and Northfield. Each of these neighborhoods has their own unique attractions. Today, we’ll highlight six of our favorites: Libertyville, Wilmette, Lake Forest, Winnetka, Highland Park, and Glenview. We’re certainly partial to Libertyville, and not just because it’s where our own home is located. Libertyville was ranked as one of the top ten suburbs in Northern Chicago by The Chicago Traveler. Just five miles west of the Des Plaines river, Libertyville has a population of 20,504; its public schools are ranked A+, its family-friendly atmosphere A+, its houses A-, and its crime and safety B+, making it one of Niche’s top ten places to live in Lake County. Its Median Home value is $425,800. Fun fact: Libertyville was home to Marlon Brando and Adlai Stevenson. Ranked number one by The Chicago Traveler, Wilmette has a population of 27,393 and Niche ratings of A+ for public schools, A+ for family-friendly atmosphere, B+ for housing, and B+ for crime and safety. The median home value is $659,200. Fun fact: in 2007, Wilmette was ranked seventh best place to raise children in the U.S. by Business Week. Lake Forest was named the second best North Chicago Suburb to live in by The Chicago Traveler. Just north of Highland Park, Lake Forest has 21,000 residents and is ranked A+ for public schools, A+ for family-friendly atmosphere, A for crime and safety, and B- for housing by Niche. The median home value is $855,5000. Fun fact: Lake Forest has great access to beautiful beaches and Chicago’s downtown. Winnetka was named number three by The Chicago Traveler. Niche gives Winnetka a rating of A+ for public schools, A+ for family-friendly atmosphere, A- for crime and safety, and B+ for housing. Its population is 12,504, and its median home value is $1,019,800. Fun fact: Winnetka’s New Trier High School is one of America’s top high schools. Highland Park is ranked as the fourth best Chicago North Shore Suburb by The Chicago Traveler. According to Niche, its public schools are rated A+, its family-friendly atmosphere A+, its crime and safety B+, and its houses B. Its population is 29,796, and it’s known for its delicious restaurants and great shopping. Highland Park’s median home value is $574,100. Fun fact: Highland Park operates as the summer home for the Chicago Symphony Orchestra. One of the largest of Chicago’s North Shore suburbs, Glenview has a population of 45,000+ and was ranked number five by The Chicago Traveler. Niche rates Glenview A+ for public schools, A+ for family-friendly atmosphere, B+ for crime and safety, and B for housing. The median home value is $488,300. Fun fact: Glenview is home to Kraft Foods, Republic Tobacco, Avon, and Anixter. 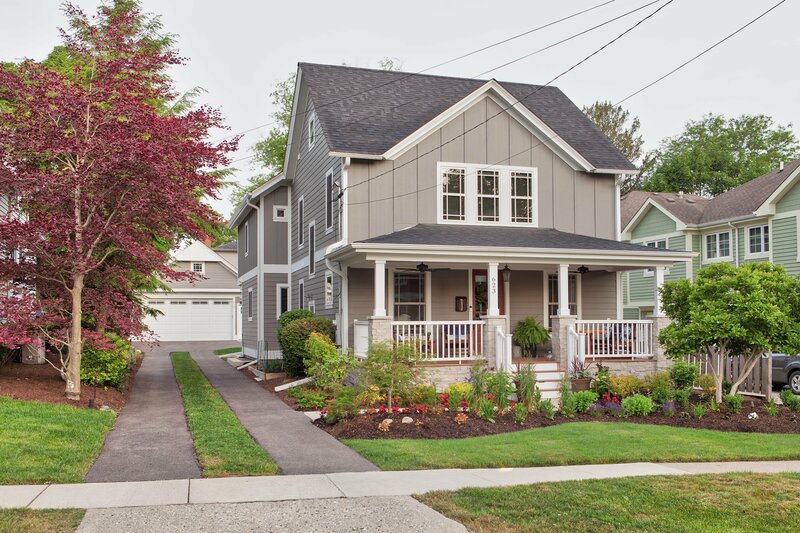 Be sure to check out our Houzz portfolio for a close-up view of some of the most beautiful homes in each of these neighborhoods!